It's a common belief that men are paid more than women for the same job in the tech field. However, based on two recent salary surveys, that belief turns out to be less accurate than you might think. However, that doesn't mean significant gender career issues don't exist. To the average female job-seeker, the gender salary gap is a fact of life -- one more obstacle to overcome in the search for high-paying, fulfilling work. The conventional wisdom is that women are paid just $0.77 for every dollar their male counterparts make, in most industries, including technology. But what if the conventional wisdom is wrong? "To the average person, it does look like there's a large wage gap. But if you take into account other pieces of the puzzle -- education, experience, job title and industry, for example -- it's not quite as dramatic as it's currently reported," says Katie Bardaro, lead economist for Payscale. PayScale provides an immediate and precise snapshot of current market salaries to employees and employers through its online tools and software, and is the creator of the largest database of individual compensation profiles in the world, according to the firm. Payscale's report, "Women at Work: PayScale Redefines the Gender Wage Gap", delves into the gender wage gap issue as it applies to the technology field in an effort to identify the factors that contribute to the wage gap. The findings are startling: in technology, the gender wage gap all but disappears. "It's not a wage gap that's the problem. It's a jobs gap," Bardaro says. Payscale's report looked at 150 tech-specific job titles and found that once the data was controlled for compensable factors like education, experience and job responsibilities, the discrepancies aren't significant, if they exist at all, especially in the technology field. Payscale's findings are echoed in Dice.com's most recent salary survey, which measures compensation levels, types of jobs held by men and women in the technology field, and overall compensation satisfaction. The findings have been consistent since Dice's 2009 Salary Survey: When comparing exactly equal titles, experience and education, men and women in technology are paid equally. The 2012-2013 Dice.com salary survey did show that men out-earned women by an average annual income of $95,929 to $87,527, but the difference is that men and women tend to hold different types of jobs within the field, says Dice.com CEO Scot Melland. "Of the top five positions held by both men and women, only Project Managers made the list. Otherwise, men and women tend to gravitate toward different jobs within technology," he says. "Our survey shows that more men are gravitating to software engineering, programming, architecture and more 'technical' positions, while more women are in project management, administration and the 'softer' technology roles," he says. Whether this is by choice or because of a systemic, institutional bias is the million-dollar question that no study has successfully answered, Melland says. "Technology is a terrific career sector to be in, whether youre a man or a woman," Melland says. "The average household income in the United States is around $50,000. In technology the average pay is between $87,000-89,000. And there are so many opportunities for other types of compensation: stock options, yearly bonuses, flexible work schedules, remote work opportunities," he says. Technology, too, is one of the more pure meritocratic fields, in which your performance and therefore your eligibility for pay raises, promotions and bonuses is evaluated solely on the effectiveness of your work, says Melland. "Tech is really pure as far as being a meritocracy. You have to be highly skilled and trained, you must constantly keep skills and training and abilities on the cutting edge as new methods and products evolve," he says. "It's a very skills-based, project-dependent field -- you either got a project done or you didn't. It was either on time or it wasn't. Your code either works or it doesn't," Melland says. These factors make tech an alluring career option for those with the education and skills to thrive, he says. The field, too, offers flexibility and an emphasis on work-life balance that aren't as available in other industries. "You can often work from home. You can take on projects on a contract basis, or other types of 'offsite' arrangements," he says. "You can help customers in Atlanta while you're sitting on your deck, in your pajamas, in Silicon Valley. And that means you're available to better juggle your home, family and childcare responsibilities," Melland says. These 'intangible' benefits completely obliterate some of the restrictions and the obstacles women face as they work their way up the ladder in other career fields, he says. Payscale's Bardaro says her data echoes the Dice.com survey in that there are more men in architecture, programming and development jobs while women gravitate toward project management, administration and other 'softer' areas, she says, because those positions have a more predictable, 9-to-5, five-days-a-week schedule that's easier to plan around. "There's a lack of flexibility in some of the harder, architecture and development, programming and coding jobs," Bardaro says. "Many of these jobs require 24-hours-a-day, 7-days-a-week, on-call availability that, if you have a family, if you're juggling other responsibilities as women usually are, they can't accommodate," she says. Therein lies the rub. In a field such as technology, with so many opportunities for advancement, flexibility, equal pay and an emphasis on work-life balance, why aren't more women flocking to the industry? "If you look at the numbers, there are fewer women now entering the field, fewer women with college majors in technology, math and science than there were 10 years ago," says Melland. "That's a conundrum, and it's unsettling. Why is that? I can only speculate, but to me it speaks to a systemic, institutional bias that starts very early in womens' education to guide them away from careers in these fields," Melland says. It's a troubling trend, and while there are no easy answers, being able to identify the pattern is one step toward addressing it, Bardaro says. 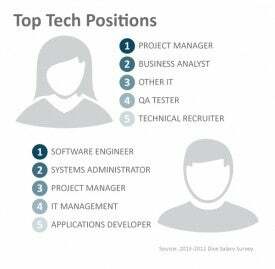 "We do see a smaller presence by women in tech-defined jobs and in college majors," she says. "When we asked 'why,' we find that traditional gender roles and expectations are at the root -- what society as a whole expects women to do is assume primary responsibility for the majority of the home and childcare responsibilities, and that expectation is insidious," Bardaro says. While women and men have the same aptitude when tested at a very young age, when their achievements, experience and skills are the same, theres no difference in their performance and thus in their pay, she says. But the gender salary gap will certainly make a comeback if fewer women are entering the technology field. What can be done to encourage women to enter the IT field, and what lessons can be extrapolated from the tech industry to other, less egalitarian fields in an effort to eliminate the gender wage gap? The system itself needs to change, says Melland, to encourage women to pursue education and careers in the field, and to remove some of the burden of family, home and childcare responsibilities from women's shoulders. Technology's importance grows each year, as more businesses and industries rely on it to grow and thrive. Therefore, the need for skilled, experienced workers in the field also will expand. 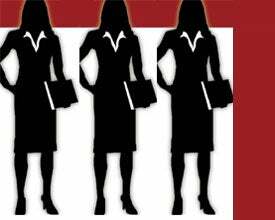 Employers need to make sure they are attracting the best and brightest, including more women. "We need to start as young as possible to encourage movement into [science, math, and technology] roles and careers," Bardaro says. "Society as a whole needs to understand that home and family responsibilities arent just a womans responsibility, and employers need to understand their employees both men and women need flexibility and a willingness to accommodate their family and work-life balance needs," she says. Sharon Florentine covers IT careers and data center topics for CIO.com. Email her at sflorentine@cio.com Follow everything from CIO.com on Twitter @CIOonline and on Facebook.